The Clarke family connects with the Man family on the marriage of Eliza Caroline Man to William Martin Whitmore Clarke on 22 June 1891, at St. Stephen’s, Ootacamund, India. William was born on 25 March 1850 and baptised at Greenwich on 3 May 1850. As noted on Eliza’s page William died on 8 May 1901. He worked for Messrs. Arbuthnot & Co, Merchant Bankers. (see the Wikipedia entry on the company HERE). Eliza and Martin had one child, Donald Morrice Courtenay, who was born in 1892 in India and who died on 7 June 1956 at Saltash in Cornwall. Apart from this and the probate record for Donald below we know little else about him. We do know that a friend of his ran Jamaica Inn on Bodmin Moor. We are not sure if the Clarke family ever became Whitmore-Clarke as shown on the probate record above. On this web site we use just Clarke. Robert was born c. 1812 in Woolwich. 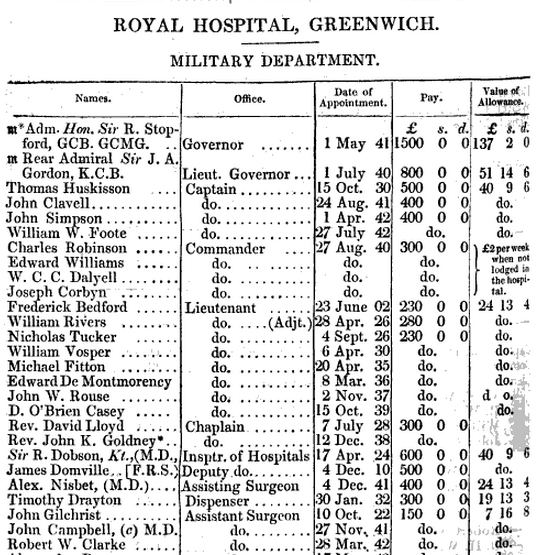 In 1834 he was included in the Royal College of Surgeons List of Candidates who received a Diploma in the month of May (Woolwich). Also in 1834 he was on the list of Gentlemen to whom the Court of Examiners granted Certificates of Qualification to the Apothecaries Hall. 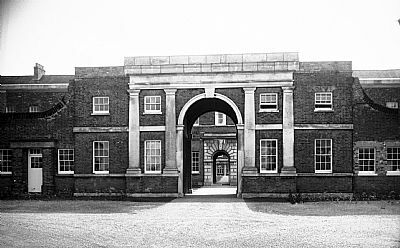 In February 1836 Robert Whitmore Clarke, Assistant-Surgeon of the Royal Navy was appointed to the Haslar Hospital at Gossport in Hampshire. In December 1836 he was appointed Assistant-Surgeon to HMS Opossum (A 10-gun brig-sloop built at Sheerness dockyard and launched 11 December 1821 (236 tons). It was decommissioned on 27 May 1841). He was Surgeon at the Greenwich Hospital in 1843 (last line on image below) and he gave evidence at an inquest in November of that year. 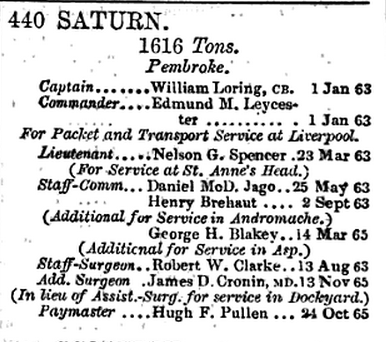 He was promoted to Surgeon in the Royal Navy on 7 September 1844 (The Navy List), and in 1845 was appointed Surgeon to the Grecian. Robert Whitmore Clarke was employed as Surgeon Superintendent on the Baretto Junior in 1850 and kept a Medical Journal commencing 23 March 1850. The Courier (Tasmania) reported that the Baretto Junior (Captain Huggins) shipped 190 female prisoners at Woolwich; three died on the passage out and one threw herself overboard. There were also 22 children embarked, two of whom died. There was one birth. Matrons employed for the voyage were Miss Gowland and Miss S. Gowland. The ship experienced a terrifying hurricane at midnight on the 10th July. The scene below decks was described by the surgeon – the situation was very sad; several seas having forced themselves down between decks, many of the poor women thought their last hour was come; the least frightened among them, under the direction of the Surgeon, baling and swabbing the water up with great industry, although they were thrown and bruised about by the heavy rolling of the ship. Read the rest of the entry here. 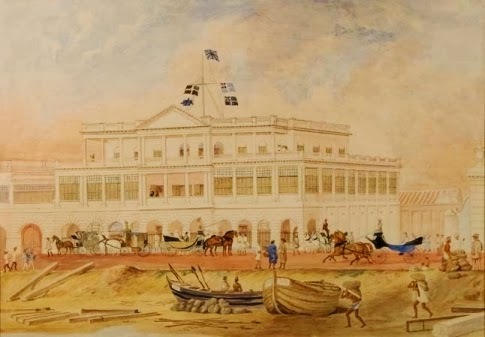 The Baretto Junior arrived in Van Diemen’s Land on 13th April 1850. A son, William Martin Clarke was born to Robert and Margaret Clarke in 1850 (Baptised in May at Greenwich). Robert is not included in the UK Census of 1851 residing at 31 Edward Street, East Greenwich. Only Margaret resides there with their two young children William (age 1) and Margaret (age 5). They have two servants. He was employed as Surgeon Superintendent on the convict ship John William Dare from Dublin in 1852. The John William Dare departed Dublin 28 December 1851 and arrived in Hobart on 22 May 1852 with 169 female convicts, 8 adult passengers and 7 children. Three prisoners and two children died on the voyage. In Melville’s Directory of Kent in 1858 his address was Laurel Place, South Street, Greenwich. and in the Medical Register of 1868 his date of Registration is 1 January 1859. 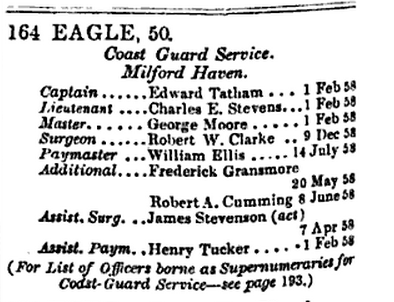 In 1867 he was promoted to the rank of deputy inspector-general of hospital and fleets on the retired list. One reference to ‘Whitmore Clarke’ has been found in The Times (9 February 1858) and that is a death notice for his infant daughter, Catherine Clara. Marriage – Clarke – Man – On June 22 1891, at St. Stephen’s Ootacamund, India, by the Rev. J. Black, William Martin Whitmore, son of the late Robert Whitmore Clarke R.N., to Lizzie Caroline (Carrie) daughter of the late Morrice King Man, of Indore, Central India. 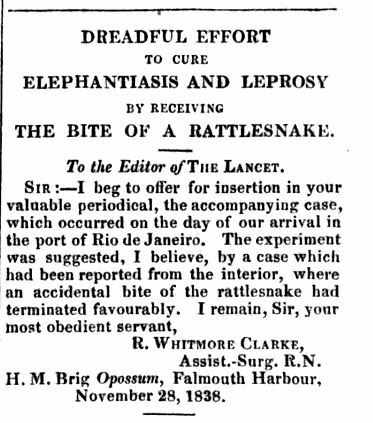 Below is Robert W. Clarke’s description of what happened to a man bitten by a rattlesnake published in the Lancet under the title: EFFECTS OF THE RATTLESNAKE POISON. Masianno Jose Machado was bitten by a rattlesnake, for the express purpose of being cured of elephantiasis and lepra. The individual, who made this experiment, was a white man, about 50 years of age, of ordinary stature, stout, and rather athletic in form; temperament, sauguineo-bilious. The kind of elephantiasis with which he was affected, was that denominated by Alibert E. Leontina; it was in its second stage, and, according to the patient, no energetic measures had been employed in its treatment. Nearly all his body, as well as extremities, was insensible exteriorly; the cutaneous tissue was thickened, hard, its surface rugous, covered with tuberculous elevations, but none of them were ulcerated. Some pustules under the arms had a porrigiuous appearance. The characters of the disease were more apparent, and better developed on the face, the features of which were swollen, giving a disagreeable aspect, without, however, rendering it altogether hideous. On the extremities the skin and nails had begun to change in appearance, and the fingers and toes were altered in form. Whilst life and sensibility appeared almost extinct on the surface of his body, his interior yet retained the remains of his former energy, and he possessed a force of mind by no means common, and seldom found in one of his sad condition. Six years of dreadful and incurable disease, and four of seclusion in the hospital for lepers, had made him look forward to death as the only termination to his sufferings. No danger counterbalanced, in his idea, the desire he felt to be freed from his disease; he willingly risked the remainder of a life, under its continuance, for the slightest probability of recovery, and no Stoic ever expired more undaunted and indifferent than he did when aware of the fatal effects of his experiment. No opinion had the least weight against the determination he had taken; nothing intimidated, nothing deterred him. Having obtained leave to quit the Lazarus Hospital, he resolutely repaired to the house of Sen. Santos, physician to the hospital, to offer himself to the fangs of the venomous reptile, whose bite sometimes destroys life in a few instants, causing, immediately, tremors, convulsions, and the blood In issue from the different outlets of the body, and even from the pores of the skin. Having signed a declaration that the act was voluntary, and that he himself was alone responsible for its results, he boldly introduced his hand into the cage of the deadly reptile; it, at first, appeared to avoid him; he advanced his hand towards the snake; it looked inoffensively at him, and began to lick his hand. Two minutes passed in this repugnance on the part of the reptile to bite him. He now provoked the serpent, and seized it in his hand forcibly, and it bit him between the articulations of the ring and little fingers with the metacarpus. The bite was inflicted at 20 minutes after 11 in the morning of the 4th September. He felt no pain when bitten, nor effects from the poison introduced into the wound; he only knew that he was bitten when it was announced by the bystanders. His hand was immediately withdrawn from the cage; it swelled slightly, and a few drops of blood escaped from the wound, but he felt no pain. The .man continued perfectly tranquil; respiration natural, and his pulse regular. Five minutes after the bite; a slight sensation of cold in the hand. 12, noon. Slight pains in the palm of the hand, which increased after some minutes. 17 minutes past 12, noon. The pain extended to the wrist. 20m. The hand swelled considerably. 30m. The pulse became fuller. The patient all this time conversed in a lively manner, and even laughed. 50m. A sensation of fullness in the course of the jugulars; some alteration in vision; formication in the face. 55m. The sensation of fullness extended to the sides and back part of the neck; the hand continued to increase in volume, and the pain extended two-thirds up the forearm. 59m. Numbness over the whole body. lh. 20m. P. M. Tremor of the whole frame; sensible to the touch. 36m. Cerebral disturbance; pulse more frequent: some difficulty in the movements of the lips; somnolency; sensation of constriction in the throat; pain more intense, and extending over the whole arm; increased intumescence of hand. 38m. Felt cold, and covered himself. 48m. Pain in tongue and fauces, extending down to the belly; increased pain and swelling in hand; coldness of feet. 2h. 5m. Difficulty of speech. 25m. Difficult deglutition; anguish; copious perspiration on the chest. 50m. Arms powerless; some drops of blood from the nose; increased anguish and inquietude; pulse 90. 3h. 4m. General swelling; involuntary groans; sensation of sinking. 15m. Great pain in the arms; restlessness. 30m. Pulse 98; flushed face; continued bleeding from the nose. 35m. Drank a little wine and water without difficulty; his shirt was changed, wet with perspiration; intense redness of the whole body; some drops of blood escaped from a pustule under the arm. 4h. Pulse 100; redness of surface more intense, but of a darker hue, especially in the bitten limb; violent pains in superior extremities, preventing any rest, notwithstanding the exhaustion of which he complained; constriction of throat, and breathing embarrassed; inferior extremities and belly as yet not exhibiting any particular phenomena. 50m. Pulse 104; great heat over the whole surface of the body; salivation. 7 P. M. Some disturbed sleep, with groans; he woke, and said he was free from pain in the arms, but had great pain in chest, and a feeling as of a knot in the throat; urine copious; deglutition very difficult; saliva viscous and white; sanguinolent fluid running from the nostrils; offered a drink of water, with rum and sugar, which he could not swallow. 8h. Sweating ceased; groaning not so constant. 9h. 10m. Passed urine; ceased to groan. 10h. Administered the infusion of guaco; dose, three tablespoonfuls, with one of eau-de-luce, which patient refused, and took the simple infusion; sanguinolent secretion from the nose stopped; pulse regular; diminution of the tubercular elevations of both arms and face, presenting an appearance of erysipelatous redness. 20m. Patient passed about two ounces of tolerably perfect urine; remains more tranquil, and sleeps at intervals without groaning. 40m. Pains in chest diminished; pains in legs and feet, in which, until this time, there had been a sensation of death-like cold; pulse regular, 108; thirst; patient drinks water without difficulty. 11h. Takes four tablespoonfuls of infusion of guaco. 45m. Urine high coloured; drinks water easily by spoonfuls; pulse 119; the wounded hand and arm inflamed, and very painful; restlessness. Midnight. Slept soundly, interrupted by eructations; pulse 112; passed urine. 30 minutes past 12. Patient very restless; his cries distressing; calls for religious consolation; refuses medicine. 40m. Again passed urine; pulse 116; sensation of great heat in the legs; desires the coverlet to be removed. 11h. Patient takes his medicine again; asks to be uncovered; passes urine; becomes more quiet. 15m. Passes urine; pulse 100. 40m. Takes a dose of infusion of guaco. 2h. Drinks three spoonfuls of water; sits up in his bed; every time he drinks, pain and restlessness increase. 30m. Takes his medicine; becomes more tranquil. 3h. Passes urine; the lower lip, which had been much swollen and inflamed, returns to its natural state; salivation ceases. 55m. Passes urine, the quantity always from 3iij. to 3iij. ; is more tranquil; takes his medicine; pulse 110; involuntary movements of right thumb and left leg. 45m. Takes a spoonful of medicine; pulse 100; patient tranquil, and sits up. 30m. Passes urine; patient declares himself in great agony. 6h. Pulse 100; respiration free; frequent groans. 9h. 15m. Great prostration; convulsive movements of the lower jaw, as also of the lower extremities; urine bloody. 10h. Pulse accelerated and intermitting; increase of convulsions; diminution of swelling of limbs, and redness of skin; deglutition extremely difficult; respiration anxious. Applied blisters to the thighs; gave a spoonful of infusion of guaco. 50m. Convulsions diminished; administered enema of brandy. 1 lh. Remains in same state. Gave an ounce of oil of Laga, which he swallowed with difficulty. 30mn. The patient expired. In a few hours the corpse became livid and more swollen; at ten the following morning, eleven hours after death, the body was enormously increased in volume, and covered with red and livid spots, exhaling a faetor so insupportable as to preclude the possibility of an autopsy, as we desired. Lancet. Dec. 15, 1838.